Meet Milo, a boy with a strong imagination and sense of adventure, as he travels to a fantastical world. Incorporate chapter questions with vocabulary and writing prompts for comprehension checks. 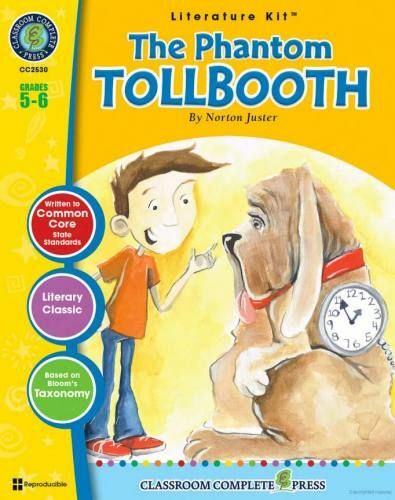 Students contemplate who would send Milo the package containing the tollbooth. Predict what Dictionopolis will be like. Answer questions with the correct character from the book. Match idioms found in the story with their meanings. Complete sentences from the novel with their missing vocabulary words. Make a list of unpleasant sounds that Dr. Dischord and DYNNE can collect. Describe how the Dodecahedron felt when Milo said numbers aren't important. Identify all the instances where figurative languages were used in the novel. Complete a Cause & Effect Web with some of Milo's actions in the story. Aligned to your State Standards, additional crossword, word search, comprehension quiz and answer key are also included. 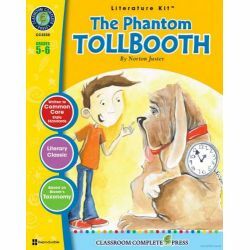 About the Novel: The Phantom Tollbooth is a story of imagination and wonder. Milo is a very bored little boy. One day, he receives a make-believe tollbooth. When he goes through it, he is sent to a magical world. There, he meets Tock the watchdog. The pair make their way to Dictionopolis, one of the country's two capitals. Here they meet King Azaz, who sends them on a journey to Digitopolis, where the Mathemagician is holding the two princesses—Rhyme and Reason—in the Castle in the Air. On their journey, Milo and Tock meet many different people and places, all with their own adventures.